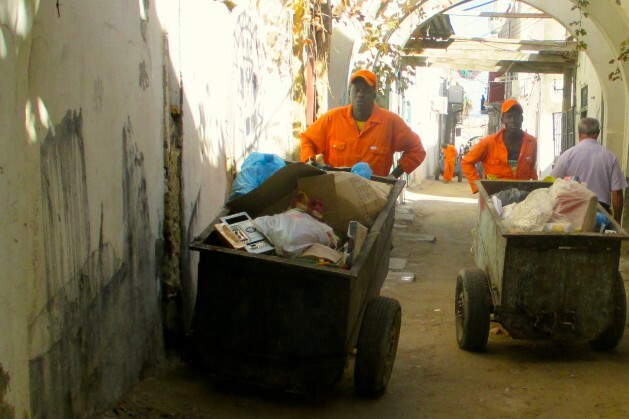 TRIPOLI, Libya, Dec 18 2014 (IPS) - It’s easy to spot Saani Bubakar in Tripoli´s old town: always dressed in the distinctive orange jumpsuit of the waste collectors, he pushes his cart through the narrow streets on a routine that has been his for the last three years of his life. Of the 250 Libyan dinars [about 125 euro or 154 dollars] Bubakar is paid each month, he manages to send more than half to his family back home. Accommodation, he adds, is free. “We are 50 in an apartment nearby,” says the migrant worker, who assures that he will be back in Niger “soon”. It is not the poor working conditions but the increasing instability in the country that makes him want to go back home. Three years after Libya´s former ruler Muammar Gaddafi was toppled and killed, Libya remains in a state of political turmoil that has pushed the country to the brink of civil war. There are two governments and two separate parliaments – one based in Tripoli and the other in Tobruk, 1,000 km east of the capital. The latter, set up after elections in June when only 10 percent of the census population took part, has international recognition. Accordingly, several militias are grouped into two paramilitary alliances: Fajr (“Dawn” in Arabic), led by the Misrata brigades controlling Tripoli, and Karama (“Dignity”) commanded by Khalifa Haftar, a Tobruk-based former army general. The population and, very especially, the foreign workers are seemingly caught in the crossfire. “I´m always afraid of working at night because the fighting in the city usually starts as soon as the sun hides,” explains Odar Yahub, one of Bubakar´s roommates. “We haven´t been paid for the last four months, and no one has given us any explanation,” the young worker complains, as he empties his bucket in the garbage truck. While most of the sweepers are of sub-Saharan origin, there are also many who arrived from Bangladesh. Aaqib, who prefers not to disclose his full name, has already spent four years cleaning the streets of Souk al Juma neighbourhood, east of the capital. He says he supports his family in Dhaka – the Bangladeshi capital – by sending home almost all the 450 Libyan dinars (225 euros) from his salary, which he has not received for the last four months either. “Of course I’ve dreamed of going to Europe but I know many have died at sea,” explains Aaqib, 28. “I´d only travel by plane, and with a visa stamped on my passport,” he adds. For the time being, his passport is in the hands of his contractor. All the waste collectors interviewed by IPS said their documents had been confiscated. From his office in east Tripoli, Mohamed Bilkhaire, who became Minister of Employment in the Tripoli Executive two months ago, claims that he is not surprised by the apparent contradiction between the country´s 35 percent unemployment rate – according to his sources – and the fact that all the garbage collectors are foreigners. “Detainees have described to us how male guards strip-searched women and girls and brutally attacked men and boys,” said Gerry Simpson, senior refugee researcher in the same report. “The main problem for foreign workers in Libya is not merely the judicial neglect but rather that they lack a militia of their own to protect themselves,” Agmar told IPS from his office in Gargaresh, west of Tripoli. “There are days when they do not even pay us, but also others when we can make up to 100 dinars,” Aghedo tells IPS. The young migrant hardly lowers his guard as he is forced to distinguish between two types of pick-up trucks: the ones which offer a job that is not always paid and those driven by the local militia – a false step and he will end up in one of the most feared detention centres. “I know I could find a job as a sweeper but I cannot wait that long to raise the money for a passage in one of the boats bound for Europe,” explains the young migrant, without taking his eyes off the road.